I peed at the CBC. You will be shocked to know that the bathroom looks nothing like the one in the picture. It's actually very utilitarian - no Wendy Messley wallpaper, no Barbara Budd hand lotion - just two stalls and a couple of lockers with some gym bags piled on top of them. It was not the Valhalla that I had always envisioned it being. I used to drive past the building on Memorial Drive on my way to work every day, thinking there's the place where the magic happens. I've been in the building a few times, mostly just in the lobby during the annual food drive, but once in the inner sanctum of the on-air studio, but even then it was only to sign a poster. Last night I had a meeting there, a sub-committee meeting for the CBC Calgary Reads book sale, for which I recently signed on as a volunteer. It's going to be a fun gig and I am pretty excited about it. I'll be writing stories for placement in community newsletters, press releases in local publications, online content, that sort of thing. It's a really good cause, raising money to provide one on one tutoring for grade one and two students who have trouble learning to read. And speaking of reading, I'd like to invite you over to New Canadian Modern to read my latest article - Greyhound Nation. It's based on my interview with the roots artist, community radio DJ, and record store goddess, Allison Brown, on a whistle stop during her recent western Canadian Greyhound bus tour. I won't say it makes for good bathroom reading, but I do think you'll enjoy it. Oh, I have peed at the CBC, too! The one in downtown Toronto, just off the famous Atrium. It was also a very utilitarian bathroom with no bells & whistles, and kind of cramped given the number of people it must serve. Well, actually, I also peed at the one near the studio where Test the Nation was filmed and that was seriously cramped for 200+ participants - most of whom were trying to do their make-up at the last minute. 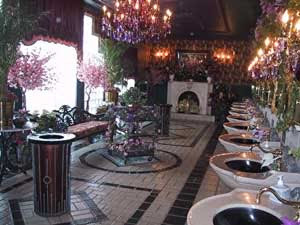 Can you imagine having a bathroom that fancy? I'd be too nervous to pee. Off to read your article now. I started earlier but work got in my way. How dare it. That's a pretty sweet crapatorium. I mean whizz palace. You've peed at two CBCs? You win, Wandering Coyoye. It was suprising how small this one was too, and I can only assume there was more than one in the building. Otherwise those CBC women are a lot tougher than we think. I'd be afraid of getting stung by a bee, Al, what with all those bloody flowers. Both excellent and apt descriptions, Beckeye. No, one CBC, two bathrooms! Your last sentence just ties it all together, doesn't it. Well done. Fancy bathrooms are scary to me. I mean, considering what we DO in there. Off to read-- extremely far from the toilet, mind you. Two bathrooms? Now that's a fancy national broadcaster, Wandering Coyote. We aim to please, John, and also to tie things together. I know someone who takes his laptop into the bathroom with him, Justrun, but that's just so wrong. And repugnant. It's a small world when I consider that I know two people who've peed at the CBC. I wish I could pee someplace famous, but the dogs are terribly territorial. Your article on Allison Brown was great, Barbara. Did she happen to mention, off the record, how bad the bathrooms smell on Greyhound buses? The CBC, unfortunately, means little to me, but out of my reverence for anything Canadian, I congratulate you on your excretory achievement. I can only wish I have had the chance to pee somewhere as awesome as the CBC. I sat in Lloyd's seat at the CTV....didn't pee in it though. The whole place was so much smaller than I thought it would be! Way to go Barb. Now if you could just encourage the parents of those grade 1 and 2 kids with difficulties to read a bedtime story to them regularly, your group might evetually be out of a job! I didn't even think to ask her, Charlie. What kind of lousy investigative reporter am I anyway? I am sure the Greyhound buses were absolutely delightful, as they always are. We must get you indoctrinated into CBC reverance, BAP. It's sort of a prerequisite into becoming a Canadian. Don't want to lose you to Radio Iceland, after all. I imagine that Lloyd is grateful that you refrained from leaving your mark, so to speak, in his seat, Maureen. Those studios always look huge on the tv screen, don't they? That is actually one of their mandates, Berni. See, you could be running this thing!